The Sun. Without it, this world would be a cold, desolate place - one which mortals could not survive on. The wise amongst mortals recognize this, and offer up praises to the Gods of the Sun. Once such God is Helios, the handsome Titan, with his solar chariot, drawn by flaming steeds. It is his duty to haul the sun across the sky every day, and thus bring light and heat to the world, allowing crops to grow and mankind to thrive. As time went on, however, more and more of the Faithful began to associate Helios' deeds with a different God - Apollo, the well-loved God of Music and Light, and many began to give Apollo the praise that Helios so rightly deserved. And what is a God without mortals to praise them? As more and more mortals turned to Apollo, Helios' influence waned, and he was forgotten by both those who once worshipped him, and the Gods that once called him brother. 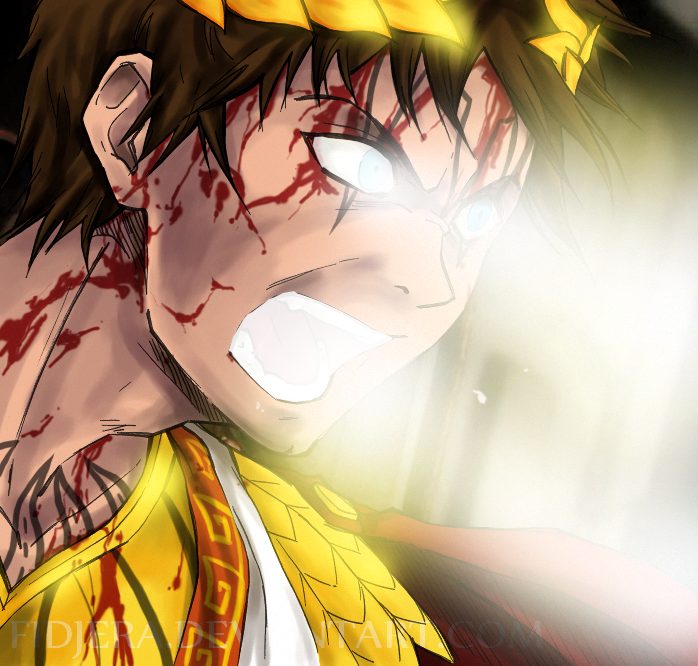 Now the war between the gods is tearing the world apart, and Apollo has already joined the battle. Those few still loyal to the true Sun God are crying out for him to take the field, and Helios has answered. He has come, bringing the full, blazing fury of the Sun with him. He will remind the world of his terrible power, and bring those who had forgotten them to their knees, scorching all in his way with fire. For this amazing piece of lore thx to "Probably_Psycho". 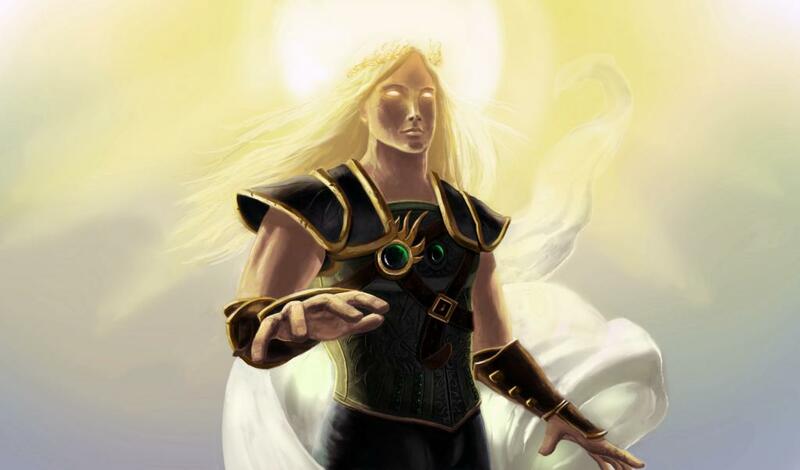 Helios can combine two of his abilities with each other that will swap the advantages from one to another, if the abilities were combined and casted then both of them will be on cooldown.After 6 succesfull combinations Helios abilities will gain 30% cooldown reduction except for the Ultimate. The passive reset when the cooldown effect occured. Helios is able to move while casting. If this ability it's combined with "Bright Look" then the targeter&ability will change and each fireball in addition will blind enemies on impact for 0.3s/0.3s./and 0.4s on final fireball. Helios emmanate intense light from his eyes and mouth, enemies caught in that area take damage every second, plus they are blinded for 1s and slowed for the duration , only enemies that face him will be blinded, in addition Helios is immune to knockback while channeling. 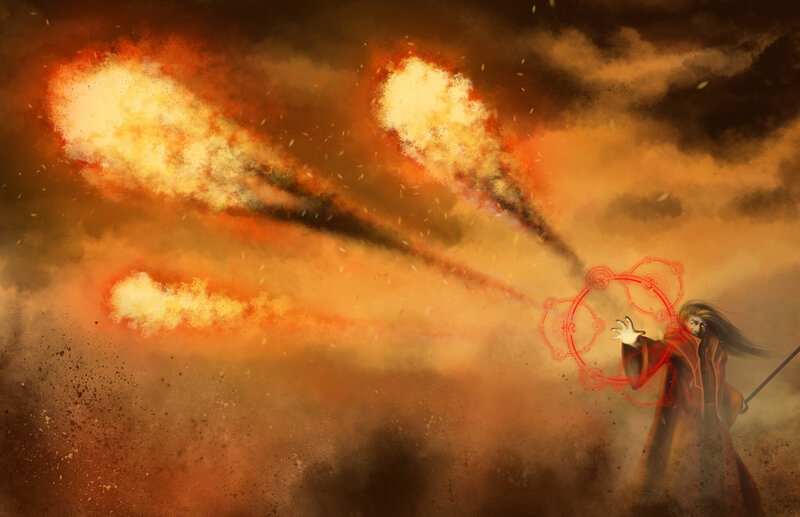 If this ability is combined with "Sunstroke" the targeter and the ability will change and Helios will fire a Spear of Light that aditionally will blind enemies for 1s and will slow them for 23%.If it's combined with "Blazing Barrage" then the ability will be the same as in first case and Helios will fire 3 fireballs that will blind enemies . Helios throw a piercing spear made of pure light that pass through enemies walls and minions and deal damage to everyone in his path.If this ability is combined with "Blazing barrage" the targeter will change and the tip of the spear will be covered with fire that will set encountered enemies on fire dealing damage every .5s for 3s. 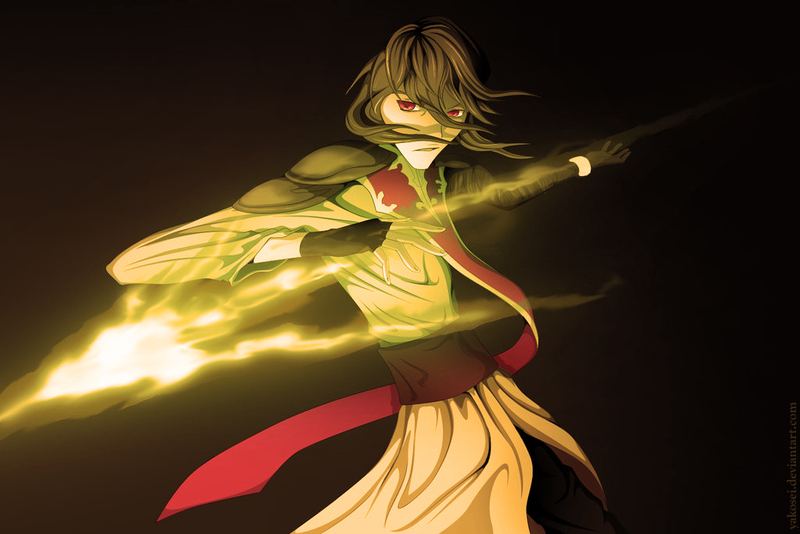 If this ability is combined with "Bright look" then the ability will be the same as in case two and Helios will throw a spear combined with light that will blind enemies on impact. his ultimate will benefit only from abilities that are up.When he consume all of his abilites the explosion will slow,blind, and set enemies a blaze , enemies caught in the midle are set on fire taking damage every .5s for 3s, enemies away from center are blinded for 1s. 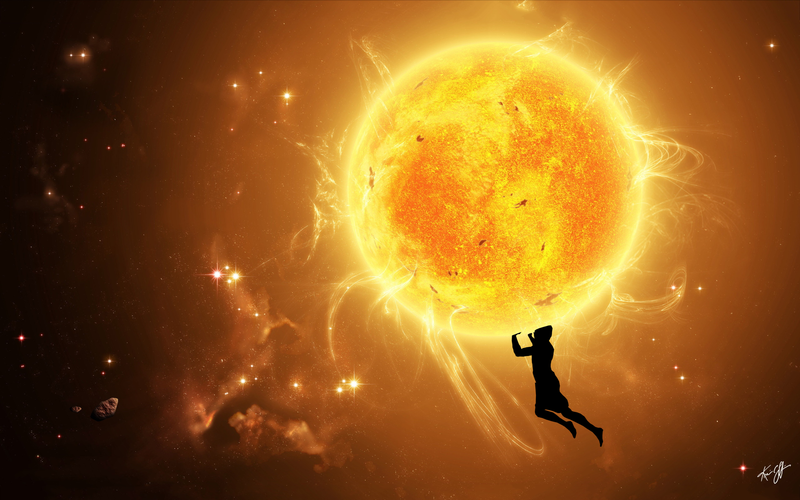 After the Sun has been thrown Helios fall down blinding everyone on landing in a radius of 10. Last edited by HazeSkater; 07-19-2014 at 11:20 AM. I quite like the concept, only I think that we've got mages enough, so I would rather see him as a tank or a support. The passive looks great, but I would remove the damage and the lifetime, so it only slows but it lasts until Helios dies or recovers his health. The skill two should slow a little more, maybe 15% or 20%, or scale along with the damage. The rest of it looks balanced enough to me, but as I said, I would rather see him in a more support-ish role. Hi-Rez i wanna see that in game. Last edited by Fro0st; 06-09-2014 at 01:13 AM. This is a really cool concept. I would change the passive radius to maybe 30 or 40 just because the slow is pretty minor. Overall though this is awesome. Thx everyone for your feedback as u can see i tweaked the stats to match your suggestions, because the community always knows alot about good and balanced gods, keep it up and say your ideas about stats and stuff and i hope that Hi-Rez will bring finnaly my concept or maybe just an idea, to the game. 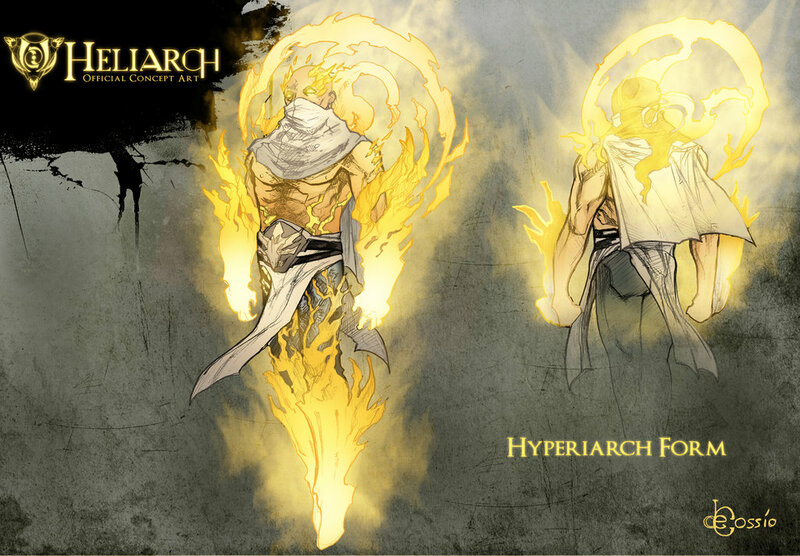 Good concept, i wanted some sun deity that can actually involve sun in his abilities and you did it quite well with that ultimate idea, and skill 2 is also interesting,VVGN bro hope to see this concept in game. By the way though almost every ability is unique and fit him well. Last edited by KIMso; 06-10-2014 at 09:11 AM. +1 for idea, kit and design. Well i thought that there will be a trouble with his chariot cuz apollo got it allready but u managed to escape this delicate question with his lore and his epic ult. Last edited by Dyos23; 06-11-2014 at 05:04 AM. Last edited by HazeSkater; 06-15-2014 at 01:37 AM.